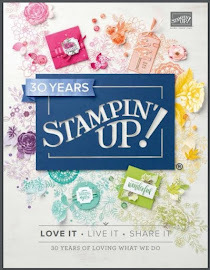 Window Shopping is another fun set that is leaving the Stampin' Up! Catalog on May 31, 2018. So many stamps, so many cards to make, and so little time. What's a girl to do? 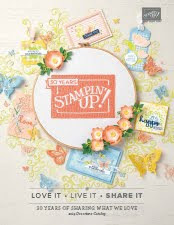 Should you want to order this retiring set, or any of the supplies I used to make this adorable card, please just click Right Here to place your order in my on-line store. The base is an 8 1/2 x 5 1/2 piece of Emerald Envy scored at 4 1/4. The Naturally Eclectic DSP layer is 5 1/4 x 4. Two of the Whisper White squares are stamped with Peekaboo Peach ink, and two are stamped with Rich Razzleberry ink. Then I cut them out with the Stitched Shaped Framelits Dies. They are glued to Rich Razzleberry and Night of Navy 1 3/4" squares. I punched 4 each of 1 1/4" circles. Two in Night of Navy and two in what else, Rich Razzleberry. I then punched out 4 Whisper White circles with a 1" Circle Punch. I used Rich Razzleberry and Emerald Envy markers to color the flower on the rubber stamp, gave it the breath of life, (breathed on the inked stamp to moisten the ink), and stamped the flower on the 1" circle. I glued all to the stamped squares with snail adhesive. The 3 1/4 x 7/8 Whisper White banner is stamped with Night of Navy ink, and under it is a 3 3/8 x 1 piece of Naturally Eclectic DSP. I glued this piece to my card with dimensionals. The little pearls give the flowers a little class, don't you think?